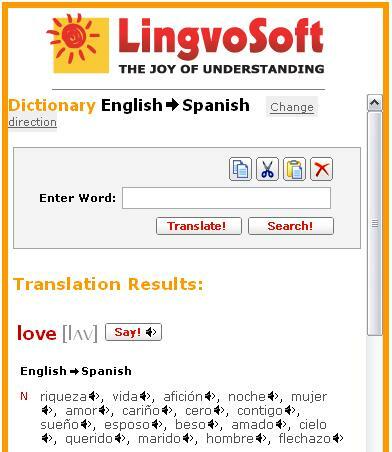 Place a LingvoSoftOnline Dictionary on your site for free. Our Online Dictionaries translate between English and more than forty languages. We also have 4 Spanish dictionaries, 5 French dictionaries, 9 German dictionaries and 8 Russian dictionaries. We are pleased to be able to offer you two types of online forms. First is a simple online form that directs your visitors to our site and opens in a separate browser window when the user submits a word for translation. The second form loads a translation pane directly into the page where it is installed, and the visitor stays on your site. To place one on your homepage you should simply put the html code into the section where you'd like to see the dictionary. You may choose any of the following designs. To get the HTML code please select one of the forms below and supply your e-mail address. You will immediately receive an e-mail containing the HTML code. Copyright info: All Free LingvoSoft Online Dictionaries placed on your site must bear the company name - LingvoSoft Online Dictionary and link back to www.lingvozone.com site. The dynamic form loads a translation pane directly into the page where it is installed, and the visitor stays on your site.